After the active orthodontic treatment period is complete and your braces have been removed, you will be given retainers. This marks the beginning of the retention phase, during which a retainer is used to hold teeth in their new positions while the jawbone, gums and muscles adapt. You must wear the retainer as instructed, otherwise your teeth may revert to their former positions, and the benefits of having had braces will be lost. 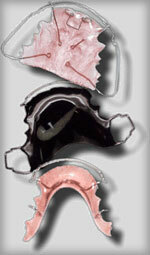 Personally fitted and customized wires,that are bonded to the lingual surfaces of the upper and lower front teeth.